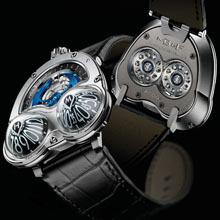 MB&F presents Horological Machine No3 Frog. Haute horlogerie is (usually) a very restrained and serious business; however one of Maximilian Büsser main goals in creating MB&F was to bring a child's sense of awe and sense of playfulness into high-end watchmaking. There is no doubting that with the HM3 Frog, MB&F have certainly achieved that aim . . . and more! The protruding eyes of the (amphibian) frog enable it to see in many directions without having to turn its head. The bulbous domes of the HM3 Frog have the opposite, but no less important, feature of enabling the time to be easily seen from many angles without having to turn the wrist. The Frog differs substantially from HM3 in that it is the aluminum domes that rotate under the sapphire crystals in the Frog, whereas it is the hour and minute hands that rotate around their respective stationary cones on HM3. 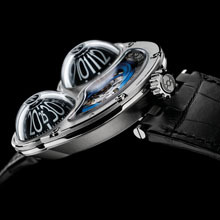 Rotating domes of this size and shape posed MB&F with a number of technical challenges. The hour and minute domes are machined from solid aluminium - chosen for its optimal strength to weight ratio. The domes weigh in at just over 0.5g. They are milled first from the outside and then the inside to arrive at a paper-thin wall thickness of just 0.28 mm, which reduces their energy requirements to an absolute minimum. Even the fabrication of the semi-spherical sapphire crystal domes was incredibly demanding and only recently even possible at all. This is due to the fact that any slight imperfection in the sapphire might introduce a disconcerting magnification effect. The sapphire has to be shaped and polished to be perfectly uniform. The Frog's unusual method of indicating time necessitated the development of a new gear train for the HM3 engine. This was because the aluminum hour dome of the Frog rotates in 12 hours compared to the 24 hour revolution of the HM3 hour hand. And as the oversized date wheel is driven from the hours, the gearing driving the date had to be reworked as well. The Frog may portray the time in a playful manner, but there is nothing but serious and meticulous attention to detail and care regarding the fine hand-finishing of the high-tuned engine purring within its lightweight high-tech titanium case. A close inspection of the case is rewarded with carefully thought out detailing including a figure 8 engraved around the domes that mirrors the form of the display back(revealing dual ceramic bearings); distinctive clover-head white gold screws; and an engraved arrow discreetly indicating the easy to read over-sized date. If the viewer's gaze manages to break away from the obiculate indications, it is likely to be arrested by the brightly-coloured 22K gold battle-axe winding rotor or the intricacies of the thoroughbred movement beneath. The HM3 Frog is available in Grade 5 titanium with blued rotor or a limited edition of 12 featuring mark-resistant black-coated titanium with green rotor. Hour and minutes information transmitted via ceramic ball bearings to rotating domes. Domes and both display backs with anti-reflective treatment on both faces. The projects that gave Maximilian Büsser the most pleasure and personal satisfaction during his seven year tenure as head of Harry Winston Timepieces, were those working with talented independent watchmakers on the exciting Opus series watches. An idea for his own personal utopia emerged; that of creating a company dedicated solely to designing and crafting small series of radical concept watches in collaboration with talented professionals he both respected and enjoyed working with. The entrepreneur in Büsser brought the idea to reality. MB&F is not a watch brand, it is an artistic and micro-engineering concept laboratory in which collectives of independent horological professionals are assembled each year to design and craft radical Horological Machines. Respecting tradition without being shackled by it enables MB&F to act as a catalyst in fusing traditional high-quality watchmaking with cutting-edge technology and avant-garde three-dimensional sculpture. 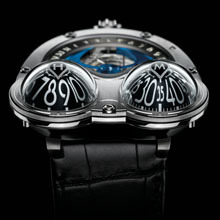 MB&F is independent people creating for independent people. Maximilian Büsser was born in Milan, Italy, before moving at an early age to Lausanne, Switzerland where he spent his youth. Growing up in a multi-cultural environment and family - his father was a Swiss diplomat who met his mother, an Indian national, in Bombay - led Büsser to develop a cross-cultural broad-based approach to his life and to business. In July 2005, at the age of 38, Maximilian created the world’s first horological Concept Brand: MB&F (Maximilian Büsser & Friends) in which he is now partnered with Serge Kriknoff. Büsser's dream with MB&F is to have his own brand dedicated to developing radical horological concepts by working in small hyper-creative groups composed of people he enjoys working with. MB&F presented its first timepiece, Horological Machine No1 (HM1), in 2007 and followed that up with HM2 in 2008 and HM3 in 2009, and Büsser has more radical machines in the development pipeline. Entrepreneurship is Maximilian Büsser's forte. In 1998 and only 31 years old, he was appointed managing director of Harry Winston Rare Timepieces in Geneva. During his seven years there Büsser developed the company into a fully-fledged and well respected haute horlogerie brand by developing the strategy, products, marketing and worldwide distribution, whilst integrating design, R&D and manufacturing in house. The results were a 900% increase in turnover and the positioning of Harry Winston as one of the leaders in this very competitive segment. Prior to Harry Winston, Maximilian Büsser's love for high-end horology was strongly imprinted by his first employer, Jaeger-LeCoultre. During his seven years in the senior management team during the 1990s, JLC strongly increased its profile and multiplied its turnover by a factor of ten. Büsser's responsibilities at Jaeger-LeCoultre ranged from Product Management & Development to Sales & Marketing for Europe. Maximilian graduated in 1991 with a Masters in Micro technology Engineering from the Swiss Federal Institute of Technology, Lausanne.